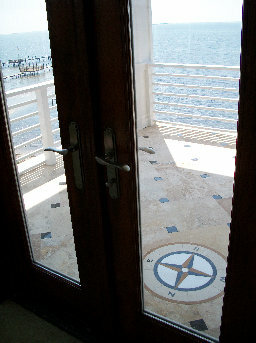 Mary and Doug contacted me to build an interior transom for their new home in Gulf Breeze, Florida. Being avid sailors, they wanted a colorful, nautical themed transom for their waterfront home. They liked the rope border and a sailboat from my website, wanted to add 2 dolphins and a mariner's compass, and a little red accent to make the transom glow. 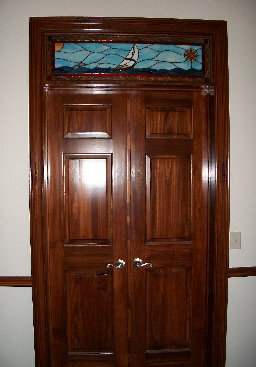 When I finished their transom in July 2009, .... since they were less than an hour from my home, I delivered it to them. I was astounded to see their new home. 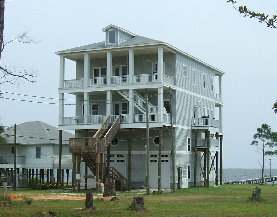 It seems that they had lost their previous home to Hurricane Ivan in 2004. 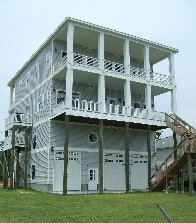 They resolved to build a "hurricane proof" house and had spent the last three years building a home that any structural engineer would be excited about. Built at least 24 feet above the ground, plywood sheathed and crossbraced, this home should withstand any hurricane.....plus it is absolutely gorgeous down to the last detail. It has a wood spiral staircase between floors, exquisite woodwork, moldings and cabinetry and even a tile mariner's compass inlaid in the tile floor. Southern Living Magazine certainly needs to do a article on the building of Mary and Doug's house. After seeing their home, I was proud to have contributed my small part to their magnificient home. Mary's Sailboat measures approximately 12" x 42", contains 179 pieces of glass, and was completed in July, 2009. Mary and Doug graciously sent me a few pictures of their home and their new transom after installation. Mary's Sailboat installed.... this beautiful woodwork is throughout the house. Mary and Doug insisted on a Mariner's Compass in their design of Mary's Sailboat. I discovered why, when visiting their house. The Mariner's Compass (above left) was salvaged from their original home, destroyed by Hurricane Ivan. Note the view off their back deck! 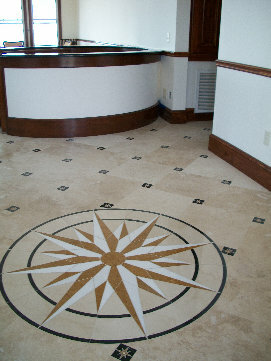 The larger compass (above right) is inlaid in tile and graces the front entryway of their home.